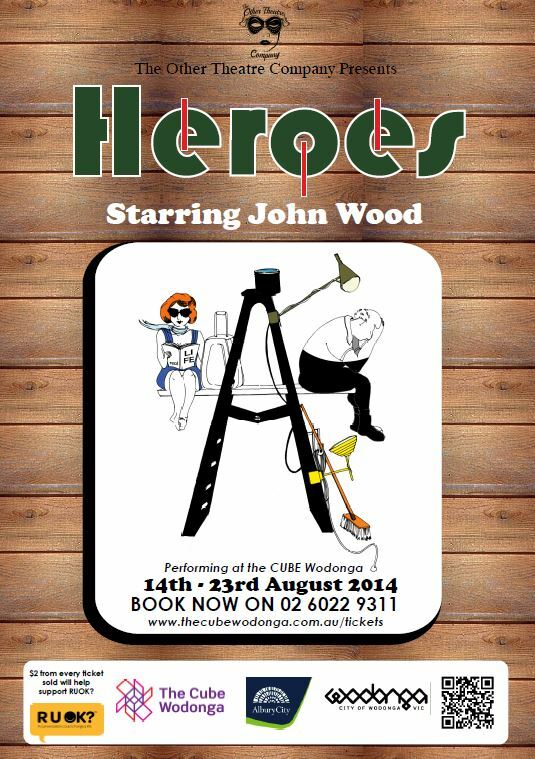 Celebrated Australian actor John Wood (Gold Logie winner; Blue Heelers, Rafferty’s Rules) is starring in a new comedy “Heroes” being staged here on the border at The Cube Wodonga in August 2014. John will be proudly supported by a cast of over 40 talented local performers. Presented by The Other Theatre Company and directed by Miguel de Oliveira, the show is written by local Mt Beauty based playwright Megan Rigoni, with original songs and music crafted by a number of very talented Australian musicians. “Heroes” is set amongst the staff of the fictional “Drummer’s Hardware Store” in a regional centre somewhere in rural Australia. We have a glimpse of the struggles, trials and tribulations of these every-day Aussie heroes as they deal with their relationship and health issues. It is a contemporary portrayal of everyday Australian males dealing with health issues, grief, loss, and depression. “Despite the serious themes, there will certainly be plenty of belly laughs for the audience – “Heroes” is above all, an uplifting comedy” said director Miguel de Oliveira. Two dollars from every ticket purchased will be donated to RUOK? day, a not for profit organisation which encourages us all to ask that question of our family, friends, colleagues and strangers to promote the health and wellbeing of our communities. It is an honour for The Other Theatre Company to produce the latest work of local playwright Megan Rigoni, Heroes. It is also a pleasure to work with celebrated Australian actor John Wood. Fortunately for us, John is no stranger to The Border. In recent years he has starred in Strange Bedfellows the Musical (2010) at the Regent Theatre and The Symphony of Life (2012) at The Butter Factory. Megan has been writing for theatre in education and arts and health since 2000. Inspired by the power of theatre to inform and illuminate an audience her work addresses health, social and environmental issues. In 2012, she wrote “The Symphony of Life” which paid tribute to leading cancer support group Brave hearts on the Murray. Whilst honouring their work, it showed the many brave faces of the cancer journey. Heroes shares a similar focus. Whilst acknowledging the very important work of men’s health and mental health support groups, Heroes highlights the importance of humour and “mateship” in supporting men through grief, loss and tragedy in their lives. Megan is employed at Bright P-12 College teaching year 2/3. Heroes grew from the men in our lives. It grew from their place in our hearts and the strength, love and friendship that they provide. Heroes has been over two years in the making. In it’s inception, the research included books and film and documentaries and speaking with a range of people including health professionals and academics. Rural health workers spoke about the devastation of drought on farming communities and the effects of suicide on families and farming communities. I researched war and the psychological effects of war, the scars that men carry and the war that continues to rage within, long after they have returned home. Friends shared their stories of separation, divorce and loss. And men dealing with serious health spoke about their pain and hardship. But they also spoke about the love of their family and friends. And each one, in the shadow of his pain, reflected humanity, life, humour and love. Through conversations with friends I created fictional characters that were real. Men are important to their families, friends and communities. At times, their lives are not easy. In fact, few are spared some measure of loss, pain and grief. Heroes is a way of expressing support to those men. And the marvellous creative team who have bought the play to life. John Wood for his friendship and expert guidance. The talented Kate Vigo, Alicia Marshall, Penny Cleary, Rudi Katterl and Joe Davis for their collaboration. Miguel de Oliveira for his great direction and support and The Other Theatre Company – a professional and tireless team. Finally to the wonderful health organizations that carry our men on their backs when they need it most…you are all HEROES! Albury City is proud to have contributed $3,000 to Intereach to assist in the production of Heroes. This funding was part of the 2013 Community and Cultural Grants Program. This production is much more than music and dance, it aims to highlight mental health issues and men’s health, in an entertaining and light-hearted way. With the rising incidence of depression and suicide among Australian males, a project of this nature is very relevant to us all. Heroes also promotes the vital importance of the supporting organisations such as The Men’s Shed, The RUOK? Foundation, Beyond Blue and the many local medical services that offer help and support to families in the region.